Product #1864 | SKU JAA011DB | 0.0 (no ratings yet) Thanks for your rating! 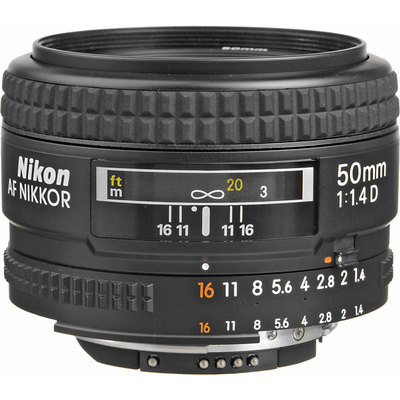 The Nikon AF Nikkor 50mm f/1.4D Lens is one of the most widely used autofocus lenses in all of photography. It delivers distortion-free, high-contrast images with superb resolution and color rendition. With a maximum aperture of f/1.4 it is fast enough for shooting in just about any type of light. Weighing only .230kg, it is easy to carry with you. This is an ideal first lens; perfect for full-length portraits, travel photography or any type of available-light shooting. It accepts 52mm filters. Closest focusing distance 0.45m/1.5 ft.